How to set up to try the 2.0 preview? How to join the community? Things are changing rapidly, so I included dates on some of the resources or issue resolutions. 9/4/2018 TensorFlow Roadmap — TF 2.0 is coming, one of the early official announcements by the TensorFlow team (more recent information is below). Effective TF 2.0 Style Guide — a summary of major changes with code snippets and before/after comparisons (this is great!). TensorFlow 2.0 RFCs — RFC stands for “Request for Comments”, which is a process to get community input on the proposed design revisions to the APIs. Reading through the RFCs gives a good idea of the changes and technical design discussions. 12/6/2018 Standardizing on Keras — answers FAQs such as Keras vs tf.Keras, and Estimator vs tf.Keras etc. 1/29/2019 What are Symbolic and Imperative APIs in TensorFlow 2.0? — a great blog post by Josh Gordon explaining details of how to create models with tf.keras Sequential, Functional APIs and Model subclassing. A GPU version of TF 2.0 for Colab became supported on 2/5/2019. To use that, include the “-gpu” prefix in your pip install commands above. There are many API changes in TensorFlow 2.0 and the easiest way to automatically apply these changes is to run the v2 upgrade script. Note: at the moment the upgrade script only works on .py. In order to run the upgrade script on a notebook you will need to convert it to/from .py. One of my favorite issues 25448 tracks the feature that modifies the TF 2.0 upgrade script to convert .ipynb files. See details on how to install TensorFlow with pip on tensorflow.org. TensorFlow signed the Python 3 Statement and 2.0 will support Python 3.5 and 3.7 (tracking Issue 25429). At the time of writing this blog post, TensorFlow 2.0 preview only works with Python 2.7 or 3.6 (not 3.7). Using a virtual environment is likely the best way to test upgrades; you can use Virtualenv or Anaconda (Note: Anaconda wasn’t working initially, but started working around 2/7/2019). So make sure you have Python version 2.7 or 3.6. If you have multiple Python versions in your base environment, you can specify the Python version when creating the virtual environment. After you create a virtual environment with Python 2.7 or 3.6. and activate it, you are ready to install the TF 2.0 preview. You can use the upgrade script to update your code to be 2.0 compliant. Note the upgrade script may not update all your code. Look at the report generated and see if you need to manually handle changes. 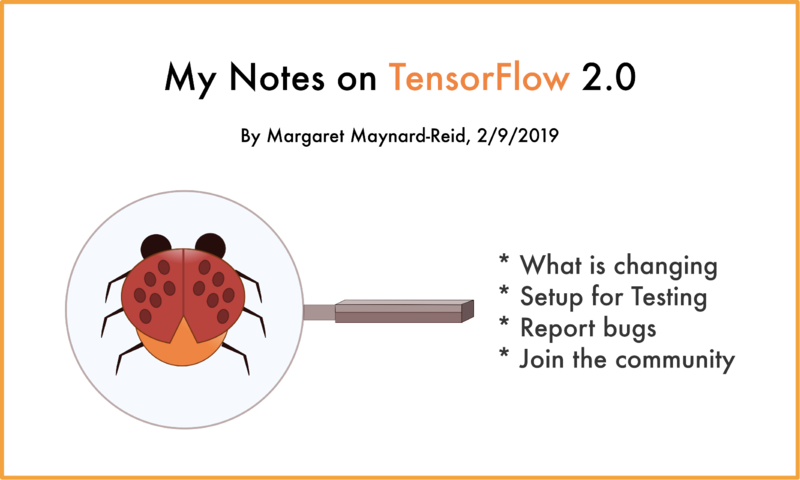 Refer to the TensorFlow 2.0 Upgrade Guide for details. Deactivate the virtual environment when done. Here is a great blog post on this topic: DeepLearning Images Revision M19. TensorFlow 2.0 experimental (link). TensorFlow 2.0 open issues (link) — you can further filter the issues. For example, to see all the issues tagged with 2.0 and TFLite, set is:open label:2.0 label:comp:lite in the Filters field. You can also communicate by using the Google groups below and the weekly testing meetings on Tuesdays, for a quick response on issues and TF 2.0 discussions. Join these Google groups to participate in TensorFlow 2.0 testing and contribute to documentation. TF 2.0 testers led by Paige Bailey— you will hear news on what to test, as well as questions and issues from the other testers. TF docs contributors led by Billy Lamberta — join this group to contribute to TensorFlow documentation. Special Interest Groups(SIGs): Addons, Build, IO, Networking, Rust and TensorBoard. Many from the community are actively testing TensorFlow 2.0, contributing and sharing their knowledge: @aureliengeron, Victor Dibia,@jerrykur, @Vikram_Tiwari, @lc0d3r… and many other ML GDEs. Follow @tensorflow on Twitter to hear the latest news on TensorFlow 2.0!